Catnic, the leader in technical innovation for steel lintels and building products, has recently provided over 40 lintels to contractors, McGoff & Byrne, for installation at the Flying Horse Pub in Ashbrook Park, South Shropshire. The newly finished Greene King development required both CG90 and CH90 open back lintels for their high quality, sustainability, and durability characteristics. 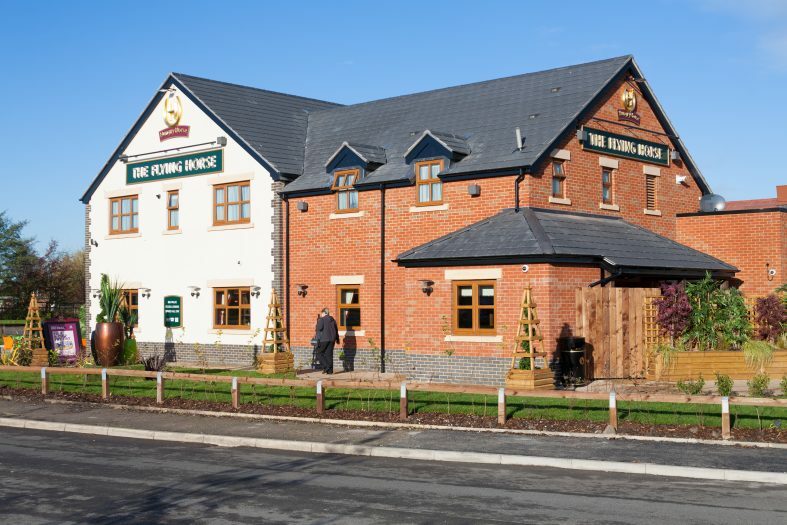 Designed to BREEAM Excellent and Greene King's exacting specifications, the traditional buildings at the pub will offer staff accommodation, plus a restaurant, parking, play area and external landscaping. With its BBA certified lintels, Catnic is commited to achieving positive environmental performance and supports government policies for sustainable development. In order to help the building industry meet higher environmental, legislative and economic demands, Catnic regularly improves product efficiency. Carl Neary from Mc Goff and Byrne explains how Catnic worked efficiently with the main contractor: "We have a great working relationship with Catnic and get very good technical support from the manufacturer, as well as competitive pricing. Catnic offered us an itemised schedule of the lintels required for this project, complete with techincal support throughout the project. The process of ordering and delivering lintels to site was repeated for each floor of the building and lintels were supplied on a 'Just in Time Basis'." Scheduling lintels swiftly and accurately is something Catnic is well known for. The Catnic Lintel Advanced Scheduling Service (CLASS) is free for contractors, architects and builders' merchants. It means that accuracy and technical performance with the right lintel in the right place is guaranteed every time. "CLASS offers peace of mind, it ensures that lintels are specified correctly; according to the wall construction, thickness and loading requirements, so there is no risk of costly mistakes that could also delay a build programme." Supply chain support does not stop here though. Catnic's on-time-in-full delivery record means that, even when just in time deliveries are required to suit the construction programme, deliveries can be scheduled to suit the customer's requirements. All of Catnic's lintels have gained the approval of the regulatory authorities both in the domestic and international market assuring designers, specifiers and builders the high quality of the product. With this, they are designed, manufactured and tested in accordance with BS EN 845-2:2003.